I need to get my hands on this sometime soon… But the wife and I can’t stop playing Dragon Age. I’ve stopped short of the end cus I don’t want to finish and started a new character to play through again and make all sorts of different choices. Only other game this year i’ve eaten alive like this was Batman: Arkham Asylum. 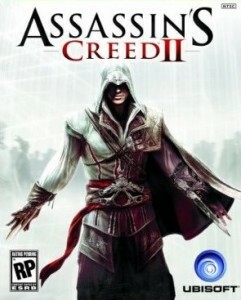 Sounds like AC2 will be like that one. Fantastic play through but probably not going to pick it up again. Where as DA:O, we are champing at the bit to get the new DLC and see what else Bioware throws at us! i do Agree with your critique of the first game, although I did finish the story at least, I couldnt be bothered to find all the Flags and whatever else: it was just too dull. With this game I completed it all. I actually like looking for the treasure, and feathers. The truth stuff, was pretty cool, although some of Prelogue ramblings were a bit over the top. I found that puzzles were either very easy, or incredibly hard. It was like watching wheel of fortune, and then watching Jeopardy, I felt like a genius, only to feel like an idiot later. All and all, A great game. And I am glad to see you enjoyed it. From your original take on the podcast last time, I thought your were gearing up to pan it. Good to see you came around. hehe i know what you mean about the genius/idiot feeling and to be honest I really didn’t think I was going to like it. In fact I remember not looking forward to play it at all. But since I do the podcast I thought I wouldn’t be doing ‘my job’ by not giving it a shot. I’m really glad I did.